Arwood Waste Philadelphia, PA Division offers a variety of roll-off and construction dumpsters that are ready to meet the needs of any-sized construction or demolition project. From a small renovation or landscape project to a new building constructions, Arwood Waste provides the right-sized dumpsters, a reliable waste hauling service and competitive prices that will keep the project on time and on budget. Arwood Waste offers purchase, leasing and rental options for a variety of roll-off dumpster sizes and styles, as well as waste hauling service and maintenance options. Keeping your construction site clean and free of debris is good for safety, appearances and helps keep up worker morale. Plus, a trashy work site can make it hard to keep your project organized and on-track. Our roll-off dumpsters are great for construction and demolition sites as well as smaller projects like residential remodeling. 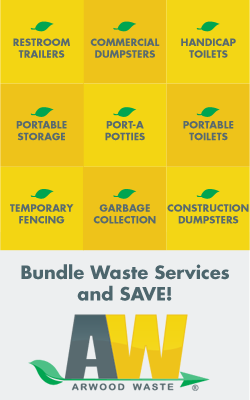 Here are some of the ways you can use our rolloff dumpster services: yard waste, construction tear outs and remodeling, bathroom renovation, roofing debris, kitchen renovation, disaster recovery and cleanup, cardboard recycling, metal recycling, driveway removal, demolition projects, and so much more! Scroll to the bottom of the page to see the roll off dumpster sizes we offer. Our dumpsters are sturdy and built with a heavy-gauge steel construction that will handle any waste thrown its ways, including concrete, metals, roofing tiles, drywall, wood, carpet and any other heavy or big items that can overwhelm your site and crew if you don’t have the proper waste removal solution in place. The roll-off construction dumpster design makes it easy to place and pick up these dumpsters, no matter how much debris and trash you’ve loaded into it. The open tops make disposing of the trash simple, no matter how large the debris, furnishing, large blocks of concrete, trees, or whatever is in the way. Our construction dumpsters are able to handle trash, debris and garbage of any size. Arwood Waste backs up its construction dumpster rental with reliable, on-time waste hauling and support service. Whatever size and style of dumpster you’ve rented, Arwood Waste will handle the removal and dumping, leaving you to worry about your project and not the trash it generates. And with the roll-off construction dumpster design, trash removal is convenient and fast, causing minimum disruptions on the job site. Arwood Waste understands that contractors have big waste removal needs. We offer a range of roll-off commercial dumpster sizes that are perfect for any sized job. Our contractor dumpster rental service is ideal for housing remodels, re-roofing projects, demolitions, new house and commercial building construction. The open-top design will make it easy to keep your site clean and the roll-off loading system will make waste hauling convenient, no matter what the job. Arwood Waste offers a full-range of recycling options for our roll-off construction dumpster services. Materials like cardboard, steel, concrete, waste water and yard rubbish can be conveniently collected and affordably recycled with our construction dumpster service. Recycling materials through Arwood Waste’s commercial dumpster service can help improve your business image while also improving our community by helping provide a cleaner environment. Construction dumpsters are priced on the size of the dumpster, the weight of the trash and the costs for hauling the waste. We offer purchase, leasing and rental plans to meet any construction or renovation need. Arwood Waste offers competitive pricing and superior service. Be sure to call Arwood Waste first at 267-519-1870 to get roll off dumpster rental prices or for any other construction dumpster and waste hauling needs in Philadelphia, PA. The experts at Arwood Waste can help review your construction, landscaping or remodeling project to make sure you have the size and service that will keep your construction site clean and orderly. On the job site, not only is having the right sized construction dumpster critical, so is having it positioned in the right way to make sure its easy to access and makes tossing waste and debris easy and convenient. If you’re in Philadelphia, PA and need a waste removal solution, call Arwood Waste today at 267-519-1870 to rent a dumpster today! Arwood Waste rents a full range of construction dumpsters. No project is too small or too big. Even if it’s just a few pickup loads, renting a dumpster from Arwood Waste will save time, money and headaches while making the project easier to finish. 10-15 cubic yard roll-off construction dumpster. Great for landscaping, small renovation projects. Holds 5-6 pickup truck loads. 20 cubic yard roll-off construction dumpsters. Ideal for a medium-sized project, garage clean out. Holds 10 pickup truck loads. 30 cubic yard roll-off construction dumpster. Perfect solution for commercial construction, residential renovations. Holds 15 pickup truck loads. 40 cubic yard roll-off construction dumpsters. Great for large construction projects, new home construction. Holds 20 pickup truck loads. Copyright © 2019 Arwood Waste of Philadelphia. All Rights Reserved.